I painted Tara in 1991 for Llewellyn's 1992 Goddess Calendar. She is included in The Goddess Oracle. In Indian Hinduism, the star goddess Tara is a manifestation of the queen of time, Kali. Her symbol, the star, is seen as a beautiful but perpetually self-combusting thing; so Tara is the absolute, unquenchable hunger that propels all life. As a Bodhisattava, a Buddha-to-be, she is considered second only to the great Avalokitesvara, of whom she is sometimes said to be a female aspect. Among Buddhists and Jains, and particularly in Tibetan Lamaism, Tara became a symbol of other hungers as well, in particular the spiritual hunger for release from the purely physical world. As such, Tara is the goddess of self-mastery and mysticism, invoked under her 108 names on a rosary of 108 beads. 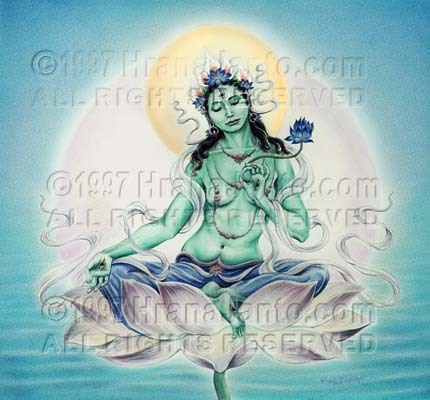 The compassionate goddess, she appears as a playful adolescent, for Tara sees life for the game it is; she also appears as a celestial boat woman, ferrying her people across from the world of delusion to that of knowledge. As the Green Tara she is terrifying, but the White Tara of meditation stares at us from her three eyes to remind us that if we look through the terror of death she waits to enlighten us.